Biathletes retire too! I will be the first to admit that I know a lot less about biathlon than cross country, though, so these athlete profile posts for biathletes will be as much for my benefit as yours. Martina Beck is (was) a very fast German biathlete. The International Biathlon Union has a nice article about her career and her decision to retire. Rumor has it she was an excellent shot, as well. I’m accustomed to skiers starting out quite slow and steadily improving. Beck appears to have been pretty uniformly fast for nearly her entire career. Using percent back has its advantages, obviously, but we still miss some interesting stuff. For instance, Beck’s two faster OWG races in 2006 were actually good enough for silver medals (individual and pursuit). 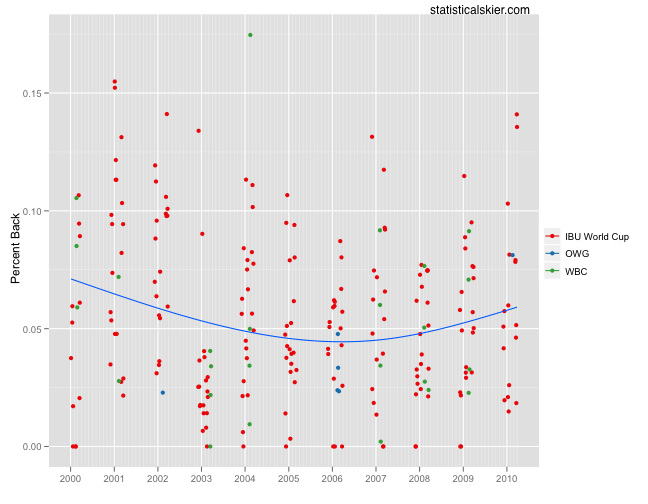 The 2002-2003 season stands out, at least from a data perspective. She just wasn’t very slow that year. Subsequently, things seemed to revert to “normal”: centered around 5% back with some much better and some quite a bit slower. 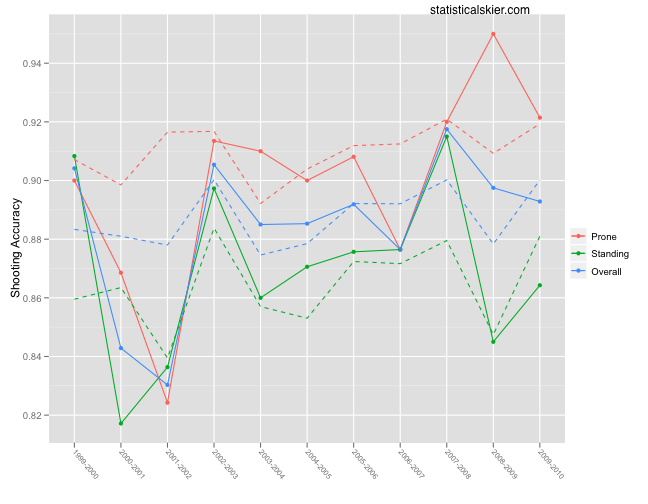 In any case, Beck has seen fewer top results over the past few seasons, and her slower races appear to be getting slower. Again, pretty typical for someone nearing the end of a career. 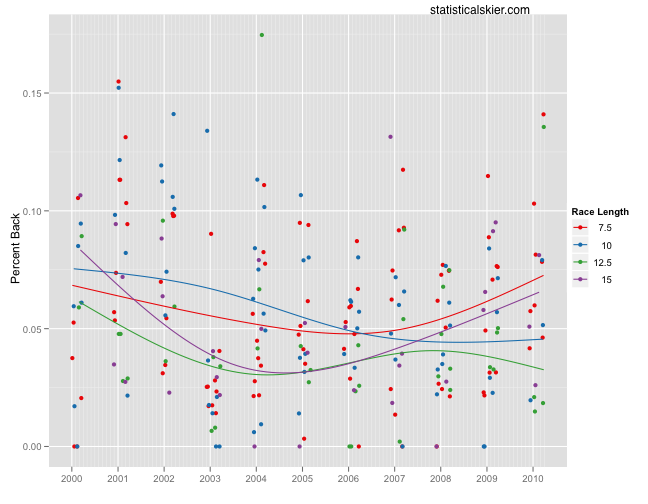 I’ve labelled these by race length, but biathlon race formats have been quite stable over the years. The 7.5km is a “sprint”, which just means it’s short and they only shoot twice. The 15km is the “individual” and is an interval start race. The 10km is a pursuit race, usually based on the results of a previous sprint race. And the 12.5km is a mass start race. I’d call that a slight preference for the longer mass start and individual races, particularly at her peak. If the rumors are true and Beck was indeed an excellent shot, this would make sense for her to be somewhat better in events that involved more shooting. There are women who’ve shot somewhat better, but they all have many, many fewer shots. I don’t have any big conclusions here. Like I said at the start, a lot of what I write about biathlon will be as much about me learning about the sport and it’s athletes as anything else. But if there’s some more sophisticated number crunching that you’d like to see for biathlon, let me know in the comments and I’ll try to oblige. Posted by Joran on Friday, August 13, 2010, at 8:38 am. Filed under Career Retrospective. Tagged biathlon, martina beck, retirement, retrospective. Follow any responses to this post with its comments RSS feed. You can post a comment or trackback from your blog.